James Bowman Lindsay, inventor extraordinary, was born 200 years ago in the village of Carmyllie, near Arbroath. Being in somewhat delicate health, he was spared the hard farming life of the day, and began work as a linen weaver. He could often be seen on his way to Arbroath, with a web of cloth tied to his back, thus enabling him to read a book during the journey. Encouraged by his voracious appetite for learning, James's parents wisely arranged for him to attend the University of St Andrews. 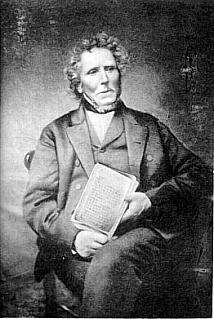 This distinguished student soon made a name for himself in the fields of mathematics and physics and, despite completing an additional course of studies in theology, he never pursued his vocation and finally returned to Dundee in 1829 as Science and Mathematics Lecturer at the Watt Institution. In 19th century Dundee, later to be dubbed the "City of Discovery", Lindsay's talents flourished. In 1835 he demonstrated constant electric light, whereby he could "read a book at a distance of one and a half foot". Regrettably, he seems to have done little to establish his claim or to develop the device, which Thomas Edison finally claimed as his own over 40 years later. In 1854 Lindsay took out a patent for his system of wireless telegraphy through water. This was the culmination of many years' painstaking experimentation in various parts of the country. The device, however, had an unfortunate flaw. In order to maximise its effectiveness, it was desirable to lay another line on dry land, which exceeded the width of water to be traversed. Although this would have been possible across the Straits of Dover, it would hardly have been practicable in the case of the Atlantic. A realistic alternative the use of significantly larger batteries and terminals was never fully explored. It should be remembered that many of the difficulties in laying transatlantic cable had not yet been solved. Lindsay himself took a great interest in the debate, with the revolutionary suggestion of using electric arc welding to join cables, and sacrificial anodes to prevent corrosion. These ideas, though not entirely new, were not to see widespread practical application for many years to come. Lindsay never forgot his religious vocation. He was an accomplished astronomer and philologist, skills which he used to investigate scientifically the historical accuracy of the Bible. The great love of his life was his Pentacontaglossal Dictionary of fifty languages through which he hoped to shed light on man's origins and prove the Bible's accuracy. In 1858, on the recommendation of Prime Minister Lord Derby, Queen Victoria granted Lindsay a pension of £100 a year. He died on June 29th 1862, having never married, and still engaged in his various researches. Like Preston Watson, the Dundee pioneer of flight, Lindsay possessed neither the will nor the sheer ruthlessness to promote his innovations as effectively as he might. A deeply religious and humane person, he refused the offer of a post at the British Museum so that he could care for his aged mother. Lindsay's chief glory lay in his vision, which helped to propel scientific advance through the 19th and 20th centuries. His Lecture on Electricity effectively foretold the development of the information society, and he confidently predicted cities lit by electricity. His concern with electric light was mainly prompted by the need to provide a safe method of illuminating the jute mills, where severe fires had devastated the lives of the workers. 140 year after his death, James Bowman Lindsay is finally achieving a certain recognition, and it is hoped that events surrounding the bi-centenary of his birth will accelerate this well deserved process.